And now it’s two for Farm Africa fundraising! Daniel Fairburn is to be joined on his Saharan desert marathon challenge by Fairburn’s production manager, Egle Kalinauskaite. 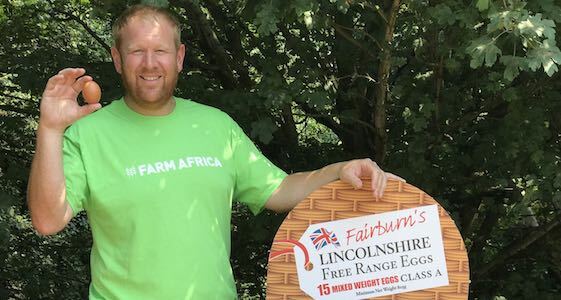 Egle will be helping Daniel raise £45,000 for the charity Farm Africa by taking part in the Saharan Challenge event with him - completing two heart-pumping marathons in just two days across the Saharan desert. The Lincolnshire pair have been training hard for the tough adventure of a lifetime which will take them over sun-baked sand dunes and rugged Moroccan mountain ranges next month. Daniel’s training regime has seen him running after work nearly every day. “I go with my wife Sarah Louise around the local area, doing at least 10k up and down hills. I enjoy doing it with Sarah Louise because she acts as a motivator, but I beat her the other day and she was just a little mad with me! It’s much more interesting running on the road rather than a treadmill because there are the sights and sounds of Lincolnshire to enjoy,” he said. Farm Africa helps combat poverty by working with smallholder farmers in east Africa to increase harvests, become self-sufficient and start businesses. To support Daniel simply click on the Just Giving link here to make a donation - every penny he receives will go directly to Farm Africa. A big Fairburn’s thank you to his supporters.